The delicate nebula NGC 1788, located in a dark and often neglected corner of the Orion constellation, is revealed in this space wallpaper. 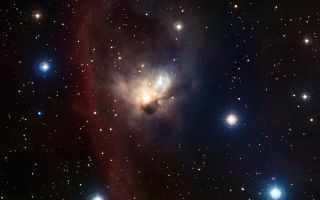 Although this ghostly cloud is rather isolated from Orion’s bright stars, their powerful winds and light have a strong impact on the nebula, forging its shape and making it a home to a multitude of infant suns. This image has been obtained using the Wide Field Imager on the MPG/ESO 2.2-metre telescope at ESO’s La Silla Observatory in Chile. It combines images taken through blue, green and red filters, as well as a special filter designed to let through the light of glowing hydrogen. The field is about 30 arcminutes across; North is up, and East to the left. This image was released March 3, 2010.